When I was two, there was a modroc demonstration that my father was the safety officer for when we were stationed in Thailand. 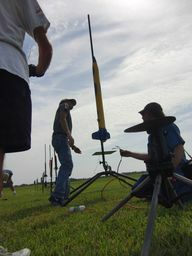 I was too young to remember this, but from the photos and the smiles on my face, I have always loved rockets! I am to the right, my brother to the left. My father is in white. Through some help from the NAR group on facebook. I was able to find an article on the event! My first model rocket memory was from 1976 when my dad purchased this kit for my brother and I. At that time I was 9 years old. By 1980, my focus completely switched to a new hobby (computer programming) and rocketry lay dormant for many years. I did not revisit the hobby until June 2013 when a friend fired off some bottle rockets. This re-ignited my interest in creating a rocket. I joined the NAR and achieved Level 3 within around 6 months. It's been a great ride and I don't see getting tired of the hobby any time soon. Below is my most epic flight to date - The Mighty Nutcracker launched in Colorado on an N1100. 3 users 95 3 26.00"
2 users 90 4 23.00"
2 users 90 2 21.60"
3 users 85 1 16.29"
4 users 85 1 24.00"
4 users 85 2 35.25"
2 users 84 3 20.25"
5 users 82 1 12.75"
2 users 82 2 26.50"
3 users 80 5 57.75"
2 users 77 3 23.30"
3 users 75 Easy 24.80"
2 users 75 2 10.90"
4 users 50 3 33.50"